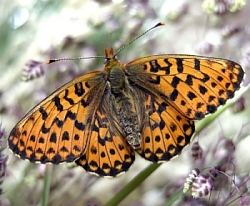 Habitat: The Pearl-bordered Fritillary, which is confined to a small area in the Burren and south Galway and is Ireland's scarcest butterfly, was only discovered in the 1920's. the food plant from about mid-May or early June, hatching in c.2 weeks. area have a contrasting yellow base, but prior to the final moult become black like all the others. August when as the 4th instar it enters hibernation. It overwinters on the ground sheltered by leaf debris and sometimes hidden in a dead rolled violet leaf. its growth and feeding throughout April. 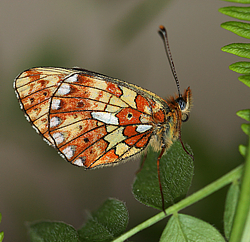 Pupation begins around mid-April among low vegetation of its food plant or among ground debris. This stage lasts up to 19 days. 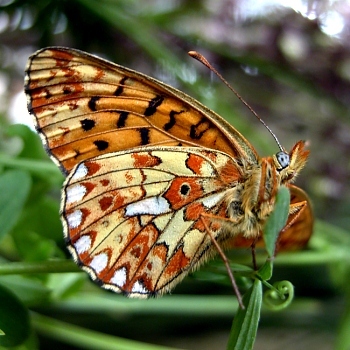 begins to lay her eggs about mid-May.